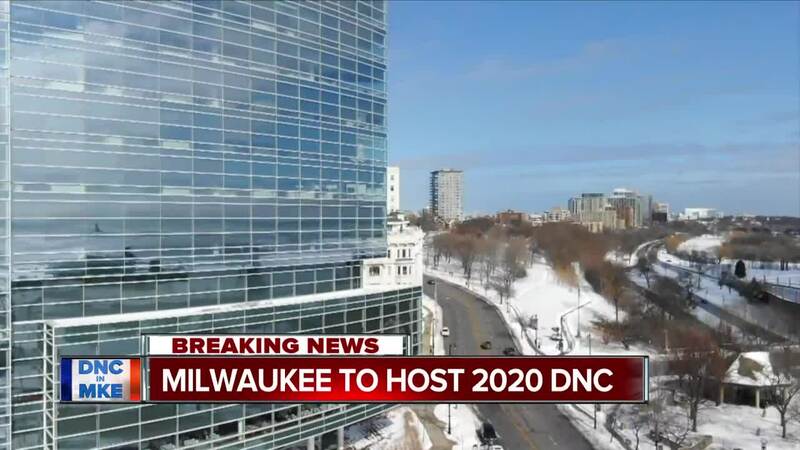 The Democratic National Committee selected Milwaukee to host the 2020 Democratic National Convention in July. MILWAUKEE (AP) — When the Democratic National Convention comes to Milwaukee next summer, the city on the shores of Lake Michigan will have its long-awaited opportunity to show the world it's shedding its Rust Belt image. State and local officials who successfully lobbied to lure the convention see a city on the rise, with a flurry of construction reshaping a downtown that was dead in the 1970s. But Milwaukee has encountered difficulty rebranding itself. It went from an industrial powerhouse at the turn of the 20th century to a city in decline as manufacturing jobs began to disappear in the late 1970s. "We're much more diverse, much more kind of sprawled-out geographically, and certainly much more economically (diverse)," said John Gurda, a locally renowned Milwaukee historian who has written several books about the city. Health care systems are now the biggest employers in the city, but Wisconsin and Milwaukee — home of iconic motorcycle-maker Harley-Davidson — haven't entirely abandoned manufacturing. It remains a key sector of the state's economy, though not at the level it was before. About 16 percent of Wisconsin's workforce is in manufacturing — second only to Indiana but far below the 57 percent of 1951. The convention venue, the $500 million home of the NBA's Bucks, is the latest addition to a rejuvenated downtown. An arena district with restaurants and a 90-unit apartment building is also in the works — development the city hopes will draw visitors day and night to what was once an undeveloped area of downtown. But that's just a portion of the construction underway. About $5 billion is being spent on projects in and around downtown, including luxury apartment buildings, hotels, and the 25-story BMO Tower office building. A new streetcar began running a 2.5-mile route in November, going south from the city's lakeshore to downtown. The line starts a short walk from Milwaukee's art museum, noted for Santiago Calatrava's distinctive addition with its towering white wings. Then there's the weather, which city officials made part of their pitch to land the DNC. Convention delegates in the summer will see a city fully alive. After months of frigid weather, residents and visitors from across the country flock to festivals every week. Some of them, such as German Fest, are nods to the city's immigrant ancestors. At one point in the 1880s, nearly a third of Milwaukee's population had come from Germany. Those roots pervade the city, from the bratwursts that are must-haves at parties to the brews made by Frederick Miller and Frederick Pabst that are staples at bars. Turner Hall, built as a community center for Germans in 1882, still stands across the street from the Bucks' arena. Mandela Barnes, the state's first black lieutenant governor and part of the committee that wooed the DNC, said the convention is a chance for people to discover a city they should know better. Barnes recalled being asked in Alabama, "Black people live in Milwaukee?" That misconception is driven by segregation that's been decades in the making. White flight and racist housing policies that made it difficult for blacks to move to the suburbs or to get loans have been major contributors to segregation. About 40 percent of the city's 600,000 residents are black, and they live almost entirely in neighborhoods just north of downtown that are among the poorest in the state. Much of the city's crime is also concentrated in those neighborhoods — places that many of the delegates might never see during their four-day visit. Gurda attributes the poverty in those neighborhoods largely to the decline in manufacturing in the early 1980s. At that time, black workers outnumbered white workers in manufacturing jobs, Gurda said. But when those jobs left, "nothing replaced them," he said. Despite the segregation, Barnes sees a diverse, culturally rich city. Nearly 15 percent of Milwaukee's residents are Latino, and the city has a large Serbian population. "Each neighborhood can experience different food, different culture, different music. I think that speaks to the beauty of it all," Barnes said. When Gurda guides visitors on bus tours of the city, he finds they're frequently surprised. "People come to Milwaukee with an expectation that it's, as you say, Rust Belt and has kind of seen better days and kind of not dynamic, not as lively a place as a Chicago, New York or L.A.," he said. "And when they come here, they are surprised by the beauty of the city."